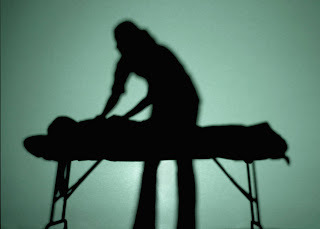 The Ardee Man: Male Massage. So last week for Valentines day myself and Molly decided to go to Chinatown for a lovely massage. As we drove into the city the traffic was crazy and I was getting even more pissed of and the massage was gonna be even more welcoming. Finally we got parked, as we headed past the shops with the hanging ducks in the windows and the smell of curry chips in the air I could feel the stress start to melt away. We seen the awning for the massage parlour and of down the stairs we went. Greeted by two Asians waiting in the reception area we where taken in the back room for our lovely massage. So Molly lies on the first table and the lady begins work on her shoulders. Next thing I mount the table and a feckin Chinese man lays the sheet over me. At this point I thought that he was just getting me ready for the masseuse, but no !! he was the poxy masseuses. Should I stop him and ask for a lady, what should I do ? He started pressing on my shoulders it felt good but the very thought of his big Chinese fingers was totally putting me off, Where had those big man fingers been the night before ? Then I could hear the air being sucked up his large spring roll sized nostrils...rotten. There I lay for one hour not really having the best experience of my life but it was alright I suppose. You could say I kinda walked out feeling the same as I walked in, the male thing canceled the rub down. Next time I will specify I want a female.